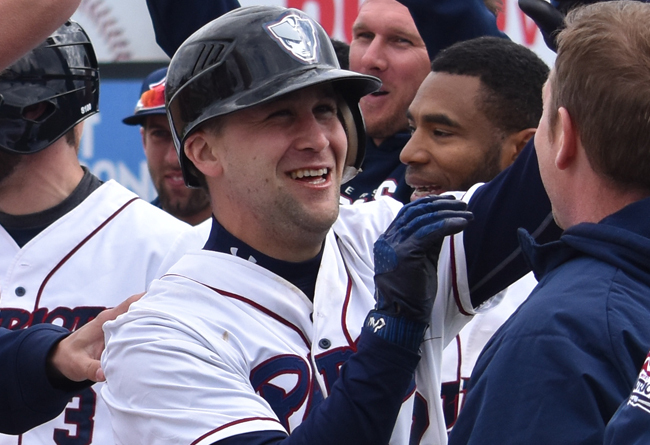 (Bridgewater, N.J., March 15, 2019) - The Somerset Patriots today announced that “fan favorite” infielder Scott Kelly has been re-signed for the 2019 season. Kelly enters his sixth season with the Somerset Patriots and sixth in the Atlantic League. He is the longest tenured player on the team, after originally earning a spot on the roster from the 2014 spring training open tryouts. The versatile infielder stole 10 bases and notched seven RBI over 55 games last year. He split time between second base, third base and shortstop defensively; all three positions in which he played frequently in 2017. That season, Kelly stole 25 bases and set career highs in RBI (31), walks (38) and triples (four). His 25 steals ranked second on the team, while he also finished third on the team in at-bats (340) and fourth in runs (52). The West Windsor, New Jersey native appeared in a career-high 116 games in 2016 and set career marks in hits (102), runs (66), doubles (17), and stolen bases (38) along with a .265 average. The 38 steals led the team and ranked fourth overall in the Atlantic League. He also stole seven bases in 2015 and 20 bases in 2014. The College of New Jersey standout owns a .244 average with two home runs, 88 RBI, 183 runs and 100 stolen bases over 395 games in his five-year career with the Patriots. The 100 steals are the third-most in franchise history, just 16 shy of tying Michael Warner for second on the all-time list (116). Kelly hit .345 and .346 in his last two collegiate seasons at TCNJ, respectively. Additionally, he is the all-time leader at TCNJ in at-bats (663) and stolen bases (98), while ranking second in runs scored (165) and fourth in games played (161).